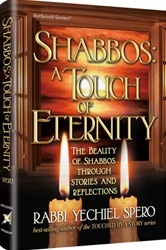 Rabbi Yechiel Spero brings his beloved stories, deeply insightful vision, and profound Torah knowledge to one of the most fundamental cornerstones of Jewish belief: Shabbos. In A Touch of Eternity we discover how the special holiness of Shabbos allows us to revisit Gan Eden each week. And while we learn and discover, we enjoy the stories that touch our hearts and souls. We meet men and women, great scholars and simple Jews, who made unbelievable sacrifices for Shabbos observance. We discover an elderly Jewish woman whose unexpected kindness at a demonstration for Shabbos observance changes the lives of an entire family. We see the power that Shabbos has to touch even a non-Jewish editor of The New York Times. A man breaks his vow to keep Shabbos - and a rebbe's dire warning, almost unbelievably, comes true. 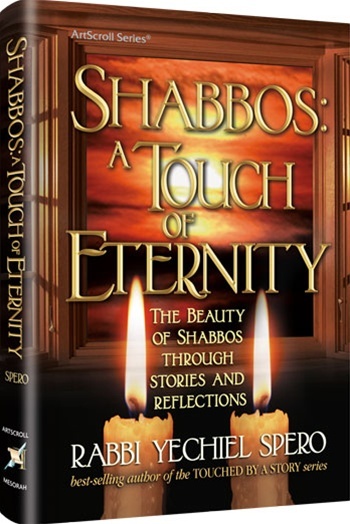 At a time when we so badly want to infuse our Shabbos, and our lives, with greater meaning - Rabbi Spero has a story, many stories, to help do just that.